Update: Due to some out-of-date information in my sources for Chikpiks, I just found out that Bert Jansch, due to an illness, is NOT playing at City Winery tonight; in fact he's had to cancel his North American tour. I for one wish him a quick recovery so that we all might get a chance to see him play here sometime soon. Like a lot of people my age (which is probably younger than you think) I'm not ashamed to admit that I hadn't heard of Bert Jansch before several of his songs were included on the soundtrack of the 2006 Noah Baumbach film The Squid and the Whale. (I am a little ashamed to admit that never would have heard of that film if it hadn't been for a certain Irish ex-boyfriend. But whatever, those were heady times). 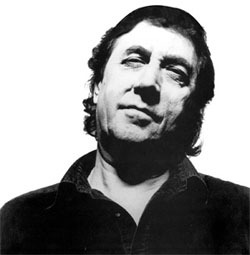 And aside all associations with high-minded New York-based film auteurs, "The Bright New Year," off his self-titled 1965 debut album, features Jansch's signature acoustic folk guitar work, always for me conjures up the sad pint-drinking mysticism of the British Isles (with a little help of memories of certain exes). His latest release, The Black Swan, came out in 2006 and is on par in every way with his earlier work. His appearances on these shores are rare, and I would especially recommend him if you're a fan of Nick Drake. The two deserve to be mentioned in the same breath.With Alasdair Roberts. Not to be confused with The Crystal Antlers (or the Crystal Stilts, for that matter, and oh, dear, is that a long, slippery road), The Antlers are a Brooklyn trio fronted by Peter Silberman (center), who, according to his Web site, "draw[s] inspiration from the likes of Raymond Carver, Leonard Michaels and Sylvia Plath." Yes, that is as obnoxious as it sounds, but try to evaluate The Antlers based solely on their musical merits, which have the expansive scope of with some jangly, joyful guitarhooks thrown in, and Silberman's Bon Iver-reminiscent vocals. Plus Darby Cicci, the bassist (right) is totally worth doing. They play the Mercury Lounge on Friday to celebrate the release of their album Hospice on Frenchkiss. It kind of seems like it might be huge. With Murder Mystery, Twin Thousands and Brent Arnold. The Phenomenal Handclap Band, which I suppose can be best be described as a cross-borough coed eight-member funk/soul collective, headed by DJs/producers Daniel Collas and Sean Marquand, friended me on MySpace, then were promptly covered in Elle, of which I feel quite proud. (It doesn't really mean anything, except that none of their members are ugly, but still). They will be glamorous, they will be loud, their live show will get you dancing. Plus it's at P.S.1, in the afternoon (and possibly outdoors?) so you'll still have time to check out the museum, then head south and check out the show listed below, should you be so inclined. Yeah, so does this show actually exist? It's not some kind of practical joke? Because this...this pretty much features every currently buzzed-about lo-fi band I can think of. It's fascinating if true. I hope to write more about the wonderful, Byrds-esque guitar work of Beach Fossils at some point later, so I'll just add that in the case of Fluffy Lumbers, I'm really not sure how much lo-er fi you can get before you're just one long string of continuous static, like your grandpa's old ham radio. But anyway, who's going to help me out? Ric? Anybody? With (take a deep breath) Family Portrait, Pill Wonder, Dana Jewell, Andrew Cedermark, Liam the Younger, Alex Bleeker & The Freaks, Frat Dad.